Looking for something to keep the kids entertained, or something you can get the whole family making together? 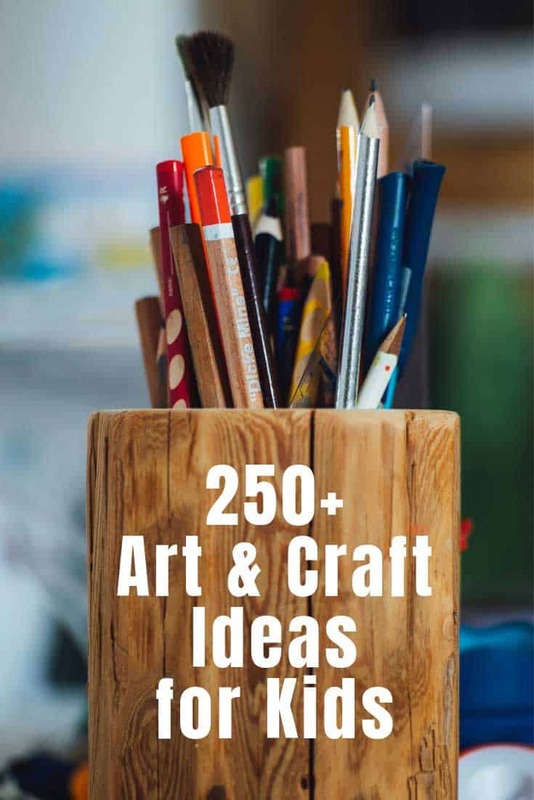 We have tons of art and craft ideas for kids of all ages to get creative with! 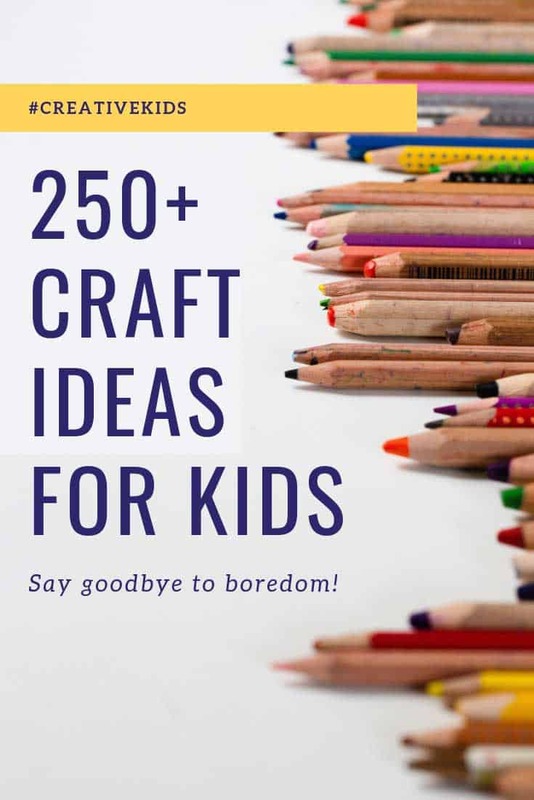 If you are looking for art and craft ideas for your kids check out these ideas. You’ll find ideas for all ages, and seasons. Enjoy! Why is art and craft important for kids? A child is never too young for an art and craft activity session, and it is so important for their development. Not only does it encourage them to be creative from a really young age it also helps their development. Cutting with scissors, colouring in pictures, and drawing with a pencil all help to develop their fine motor skills. Craft projects are also a natural way for children to learn the names of colours and shapes. You can even introduce counting and literacy skills all while your child is having fun painting or sticking. And older children do too! As children grow older crafting is a still a great way to learn new skills. Perhaps they want to learn how to draw or paint with pastels, how to make their own jewellery or sew or crochet. Aside from actually learning how to do the craft they are also developing their STEM skills. Just think about how many crafts rely on patterns, building or construction. If you worry that your child prefers to spend more time being creative than doing their academic school work just think about how many math and engineering skills they are actually developing while doing something they love! Art and craft projects are also a gentle way to learn patience and perseverance. Craft projects take time to come together and even little ones can attend for long periods while working on their creations. 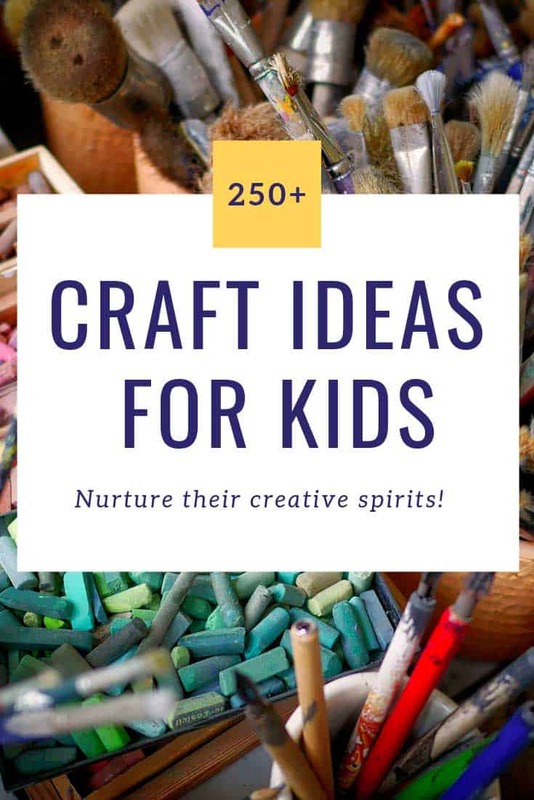 Just with grownups crafting sessions help children to relax. When they are focusing their attention on their craft projects it gives their mind a break from their other thoughts helping them to feel calmer. Of course nothing beats a crafting session as a family. Kids love spending time with mom, or dad, or both and family craft sessions are a great way to spend quality time together. Why is displaying children’s art important? Your child puts their heart and soul into their creations, even if at first to us grownups they just look like scribbles on a piece of paper. To build their confidence and show that we value their creativity it’s so important to put their art and crafts on display. 1. It could be as simple as sticking their latest painting on the wall with blutack or washi tape. 2. 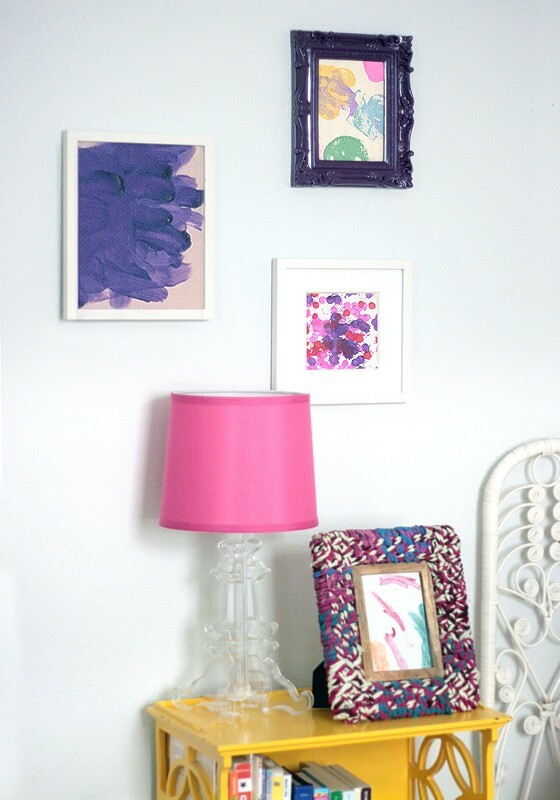 Or you might want to put things in frames to make them more permanent. 3. You could even give them blank canvases to paint on with the intention of making a gallery space on your wall. 4. Another alternative is to make a scrapbook together, either by pasting in their actual artwork, or for larger creations taking photographs and then having them printed in a photo book. 5. 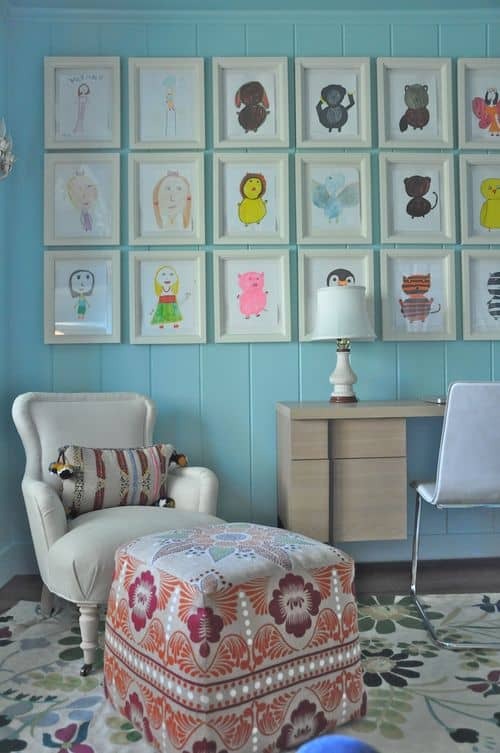 If you find yourself running out of wall space you might want to introduce your child to crafts that can serve a purpose. Like a jewelery box, or a picture frame that can be given as a gift. Or seasonal decor you can use to decorate the mantel or the front porch. They could even make games and toys they can play with themselves! Don’t forget that being creative isn’t just about painting, drawing and crafting things. It extends to the performing arts too, like acting and music. Have a think of ways you can encourage their creativity at home using some of these ideas. 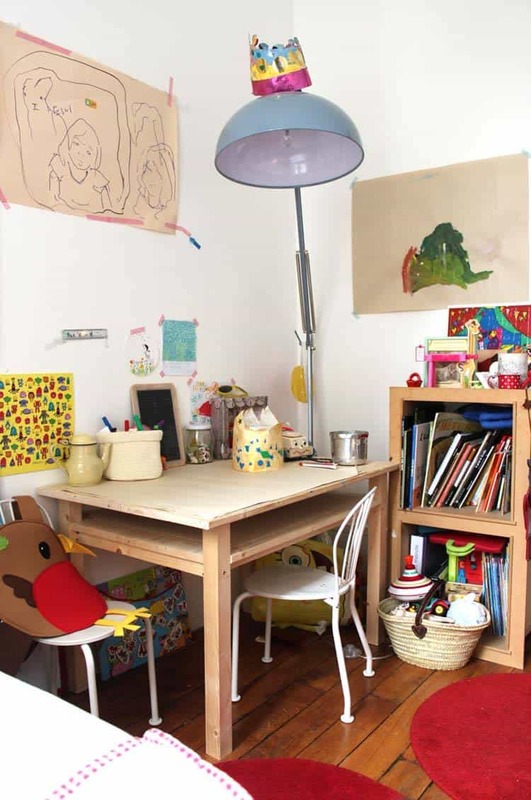 Set aside a space in your home where your child can go to be creative. If you have space it might be a permanent spot with a table and shelving for setting out supplies. Fill it with as many art and craft supplies as you can. Think cardstock, paper, glue, scissors, paints, brushes, pens, crayons, stickers, washi tape, craft sticks, ink stamps and glitter. Add items from your recycling box like egg cartons, cardboard boxes and milk cartons. Anything that you think will spark their imagination. It’s not only toddlers who like to dress up, older kids enjoy getting into character too. Fill a box with old Halloween costumes, dad’s old shirts, items you no longer need like hats, scarves and purses. You can always pick up some things at Goodwill if you need to. Then encourage your kids to be dramatic. You could add props and costumes to your read aloud sessions, and encourage your kids to make up their own stories and act them out too. You don’t have to go out and buy a piano, but bringing musical instruments into your home for your children to explore is a great idea. For younger children you can purchase music sets with drums, shakers and other percussion instruments for under 30 bucks (check these out at Amazon). For older kids you might want to try a ukelele or even an accordion! Of course you could also put that craft station to good use and spend the weekend making your own musical instruments! With or without instruments its easy to bring music and dance into your day. Pop an Amazon Echo onto your kitchen counter and ask Alexa to play you some music while you’re doing the dishes and encourage the kids to dance as wildly as they can. Or pick a random radio station to listen to in the car. Dancing and singing is a great way to lift your spirits and is fun to do as a family! Imaginative or pretend play is important for your child’s development because it’s how they come to understand the social and emotional side of life. It’s a way of exploring the world around them, learning how to take turns and problem solve. Imaginative play is a creative expression, and you can often spark their imaginations by encouraging them to make their own playthings and toys. Most children get much more enjoyment playing with things they have made for themselves (or you have made for them) than they do from expensive store-bought toys. And just think, not only does it save you money but you’re also teaching them to be environmentally responsible by being able to make things for themselves from scratch or by repurposing something that would otherwise have been thrown away! Strewing is the art of leaving things lying around for your children to pick up and look at to inspire them to be creative or learn something new. You might want to leave some craft books open in their crafting space to inspire them to make something. Or books about famous artists to introduce them to different styles that they might wish to try out themselves. Or you might wish to bring in items from outside: flowers, pebbles, fruit, sticks and leaves, bird feathers or seashells. Explore them together and think about whether you’d like to try and draw them, paint them, or even craft with them. Even just emptying out the recycling box onto the craft table is a good way to inspire your kids to be creative with some junk modelling. Before long they’ll be asking you to bring home a car filled with empty boxes of all shapes and sizes next time you go to Costco! Next PostNext 100+ Easy Meal Prep Ideas For the Week You’ll Want to Try ASAP!